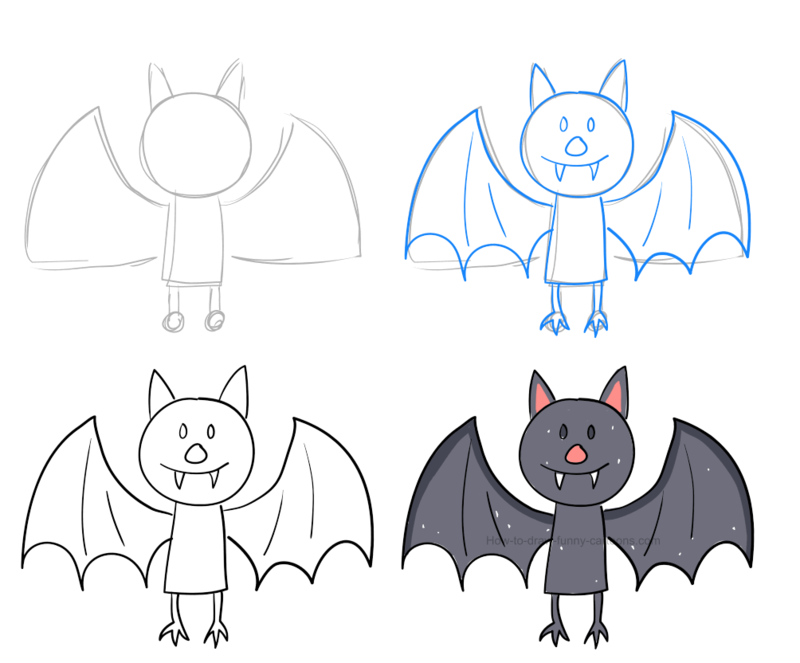 Sketch and create colorful bat pictures using this simple step-by-step tutorial as a starting point. You will learn how to illustrate this adorable character quickly and easily using various curved lines, basic shapes and plain colors. 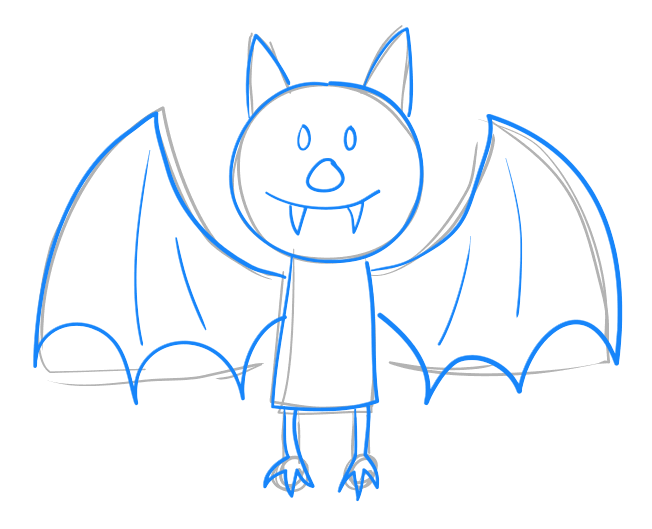 Bats are fun to work with because they can be cute and frightening at the same time. These surprising creatures are easily recognizable and can create a wide variety of emotions to your viewers. 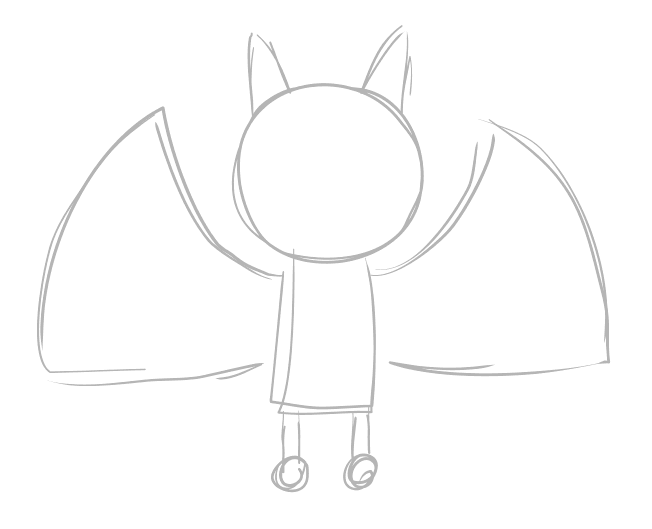 Ready to draw a nice cartoon bat? Cool! Let's proceed now! Now that you have watched the video and are more familiar with the character, here are all four steps needed to create this illustration in just a few minutes. You can start by drawing a few basic shapes that will be used to create a template. This template will be useful later to draw all lines and shapes with accurate proportions. First, draw a large circle to form the head. Next, create small ears on top of the head using triangles. Wings are made from a mix of long curved lines and straight ones. The body is done with a large rectangle while the leg and feet are represented by circles and small rectangles. It's now time to use this template to draw the character itself on your piece of paper. Notice how the eyes are made from tiny oval shapes and how the nose is much larger using an irregular circle. The mouth is made from a curved line and the teeth are done using small triangles. Once you are done, you can remove the template (gray lines) created earlier. We don't need it anymore. This is how the illustration should look like now that all black lines are added. It's a pretty basic character, but something is missing : colors! It's time to select the perfect colors that will be used to turn this boring illustration into something visually more exciting. For this character, I have selected a nice and subtle gray color that is slightly blue. The pupils and the top of both wings are darker. Finally, a bright pink color is added inside the ears and the nose. Both teeth can remain white. Good work! 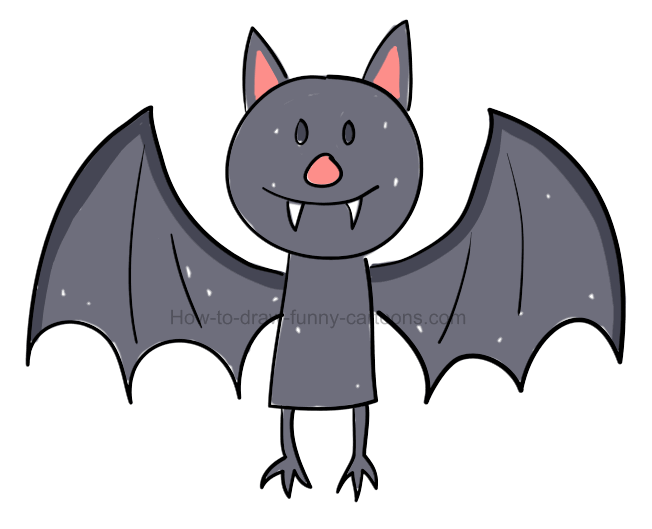 This cartoon bat looks amazing now! 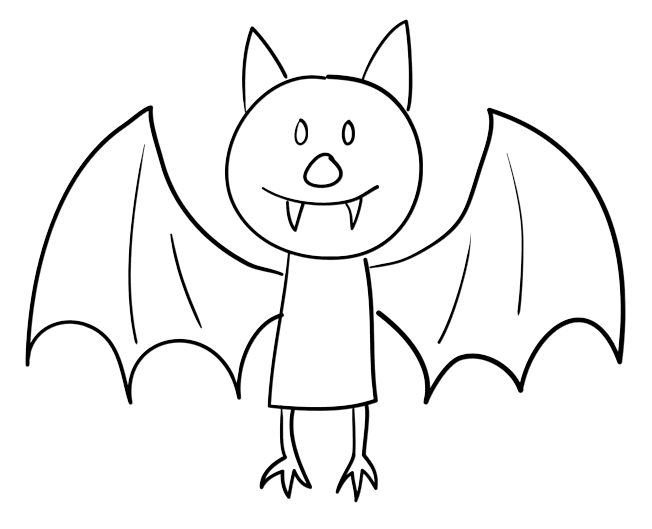 Draw more bats and have fun!